Buying a dip is much easier said than done. While the market is going up, it’s easy to tell yourself that you’ll buy once the market goes down a few percent. But when that moment finally comes, it’s usually sudden. Then you may decide not to buy because you think the market may drop even more. But if you’ve followed my dip-buying strategy since the 2008 crash, you’d be set. More recently, since January 1, 2016, there have been 37 days where the S&P 500 Index has closed 10% or more below its 52-week high. If you had bought shares of the SPDR S&P 500 ETF (NYSE: SPY) on each of those days, you would have made an average 3.42% gain in the following month. After two months, you’d be up 7.73%. That may not sound like a lot. But the average monthly return since then for SPY is just 0.77%. And if you use options to buy on dips, it’s cheaper, and you can make even larger returns. So, while buying the dips can be scary, especially when they catch you off guard, it’s been a great strategy in recent years. The chart below shows an opportunity that’s come up this week to take advantage of my dip-buying strategy. 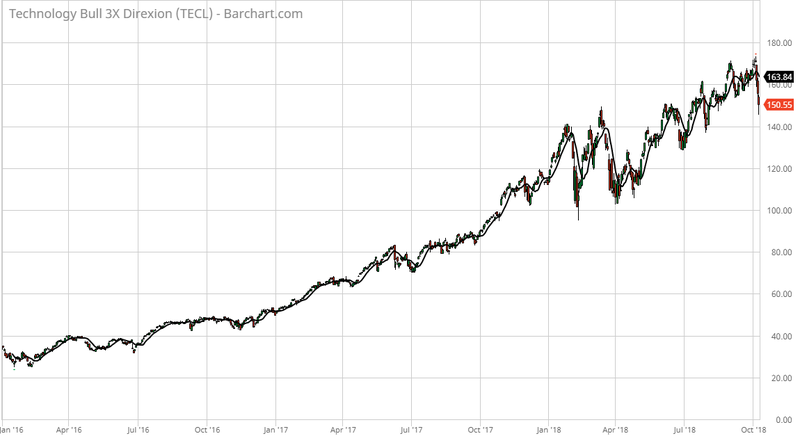 Over the past week, tech stocks have gotten hit hard. That’s driven the price of the Direxion Daily Technology Bull 3X ETF (NYSE: TECL) down over 16% below its 52-week high as of Monday’s close. Because this is a 3X exchange-traded fund, it moves at three times the rate of the overall tech market. That carries more risk, of course, but it also allows for quicker, bigger returns. Because TECL moves much quicker than the market, it’s fallen 16% or more from its high 113 times. But it’s also been quick to bounce back. Since January 1, 2016, if you’d bought it every time it was down 16% or more, you’d average an 11.6% gain over the next month, and a 22.6% gain over the next three months. So, even though a big drop like this looks intimidating, it’s actually a great opportunity to buy.